America the Beautiful Quarters honor one of the most popular, beloved of all United States landmarks: Ellis Island. This landmark, which is commonly visited by tourists visiting New York City, is featured on the America the Beautiful quarter honoring New Jersey, the state in which much of Ellis Island mainly sits. There's a reason why the Ellis Island quarter has the potential to become a favorite coin for so many coin collectors. A whopping 40 percent of Americans can trace their ancestry through Ellis Island. How Can You Find The 2017 Ellis Island Quarter? The United States Mint released the Ellis Island quarter on August 28, 2017 for circulation. While you can find Ellis Island quarters in your pocket change and at the banks, you can also score examples of the New Jersey America the Beautiful quarter in United States Mint proof sets, uncirculated sets, and rolls. What Is The 2017 Ellis Island Quarter Worth? The 2017 Ellis Island quarter is a generally common coin that is widely available through circulation and in U.S. Mint coin sets. At this point, circulated (worn) New Jersey Ellis Island quarters are worth face value and uncirculated specimens have a value of 50 cents to $1 for typical specimens. Proof Ellis Island quarters are worth about $2.50 or more. Values may be higher for error New Jersey quarters if any are discovered. Who Designed The Ellis Island Quarter? The reverse (tail's side) of the Ellis Island quarter was designed by Barbara Fox, who is a member of the United States Mint Artistic Infusion Program; the reverse design was engraved by Phebe Hemphill. The design seen on the New Jersey quarter is one of eight original proposals that were considered by individuals involved with finalizing the coin. The obverse of the 2017 Ellis Island quarter features a bust of first United States President George Washington. The visage of Washington was designed by John Flanagan and first appeared on the quarter in 1932, later revamped in 1999 by William Cousins. 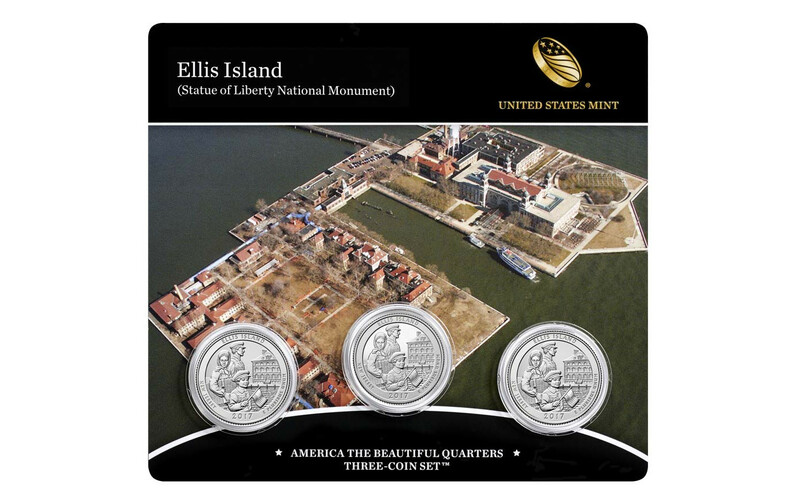 The Ellis Island quarter is the fourth quarter to be released in 2017 as part of the America the Beautiful Quarter program, which began in 2010 and honors various national landmarks in each of the 50 states plus Washington, D.C., and the nation's territories. The America the Beautiful Quarter series is slated to run through 2021 and honors New Jersey just once, with the release of the Eliis Island quarter. The Ellis Island design also appears on a five-ounce silver bullion coin.